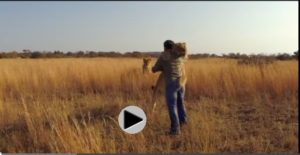 An Incredible Reunion – Huge Lion Hugs Rescuer. Valentin Gruener gets a huge “thanks!” from Sirga the lioness. He saved her when her pack turned away from her. Now she lives at Gruener’s Modisa Wildlife Project, in Botswana, Africa. A wonderful, moving experience, showing how love extends over time between our furry friends, large in this case, and ourselves. Rating: 2 hankies. This one may make you cry.